Dutch Pro Take Root is a scientifically developed 100% all natural root stimulator and extreme root booster to create larger more robust root systems. The improved roots increase the nutrient uptake to propel more cell division and elongation of cells which naturally increase nutrient absorption. Dutch Pro Take Root is best used during vegetative growth phases all the way through the second week of bloom and fruiting stage. Dutch Pro Take Root is specifically developed using 100% natural ingredients that include essential hormones and micro nutrients to support and propel root strength and growth. Dutch Pro Take Root slows the plant aging cycle, develops strong and healthy root systems to improve growing and create larger and faster production of crops. 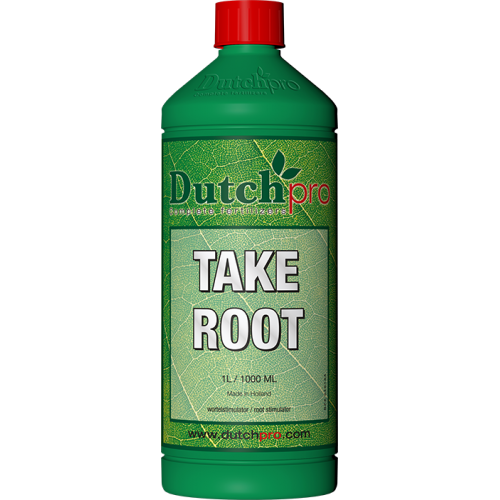 If you want larger, healthier plants with extra strong and large root systems to support your plants cells, growth and crop production, use Dutch Pro Take Root. Dosage: 1ml per 1 Litre of Water during the entire vegetative phases through to the second week of bloom and fruiting phase.